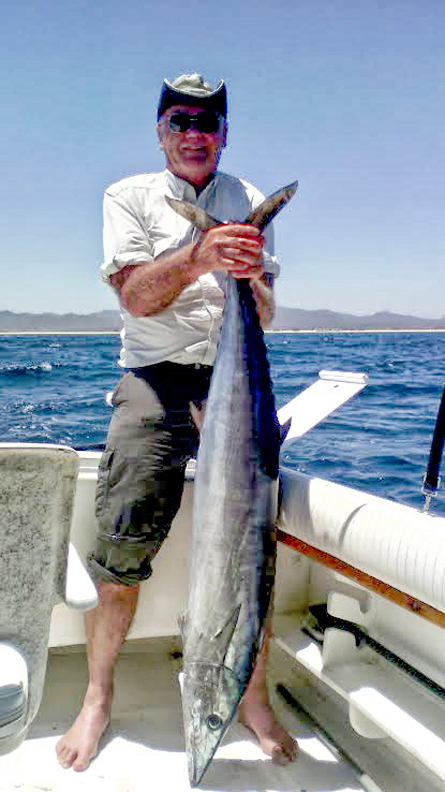 560 nautical miles on Baja water … not many fish. 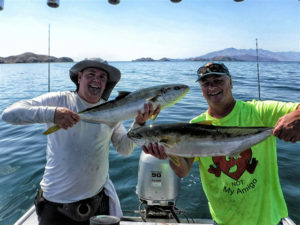 We continue to whack away at the bottomfish as we hopefully watch and wait for the dorado bite to begin! 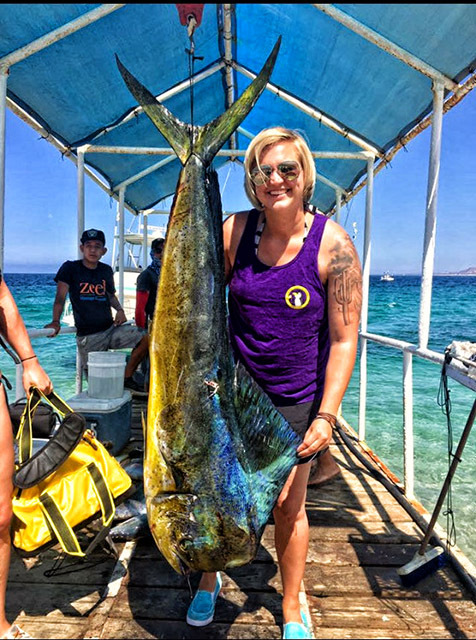 Yellowtail have been working bait schools all the way to the surface with some of those upper level attackers falling victim to the iron! Tony with a big yellow caught on the old blue and white 6X jr! Now bottom fishing requires traditional rigs on the bottom and surface action weapons at the ready. When you spot any bird activity grab a rail and hit the throttle! We cast both live mackerel and iron into six different boils on Thursday and hooked up a 32 pound ‘tail. 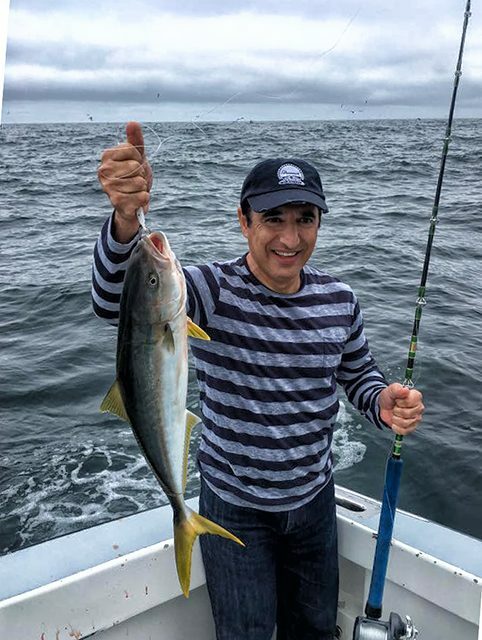 The fish didn’t want mackerel and a little investigation after the fact revealed the yellowtail had been herding schools of sardina. 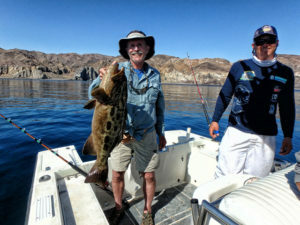 One 20 pound dorado was caught but it was so far offshore that I hesitate to call it “local”. Thirty miles straight out is not something that the local captains would be ready for in a panga. Also, on Thursday we had a shark encounter which was the extreme opposite of “shark attack”. We spotted a black fin on a glassy surface and circled to investigate. Our slow approach resulted in the seven foot shark also circling and looking. I have been “educated” to respect them as an important part of our ocean world but this seven foot long snaggle tooth creature really put meaning into it. The shark had a very big hook in his outer mouth and had been dragging a 20 foot long leader for what appeared to be months.He swam back and forth as if asking for help almost touching the boat and outboard motor. (No aggression and he was close enough to touch many times.) We could do nothing except donate some dead mackerel which he ate and then slowly parted. That left a dent in my emotions that should last a long time. Cast N Reel at Outpost Charters. You name the blue water pelagic and it’s biting on the East Cape right now! 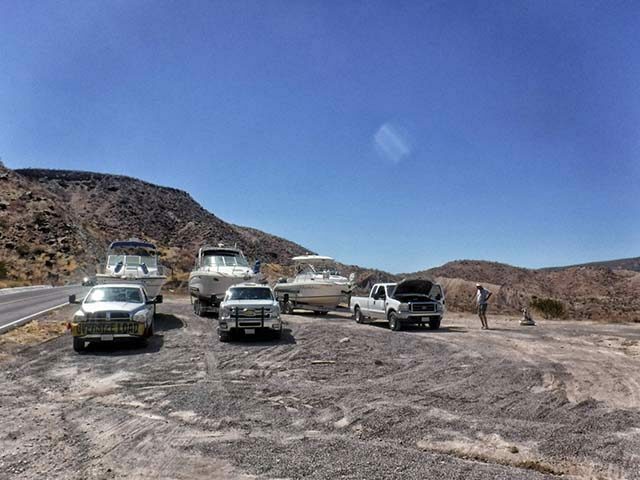 Rancho guests enjoyed the best week of fishing in the past three years. The action for striped marlin was much improved this week, though now with the full moon phase these fish can become more finicky during daylight hours. One of the more productive spots was the 1150 area, with many boats reporting three or four hookups per trip; the stripers were coming up on trolling lures and rigged baits, as well as being spotted tailing on the surface and striking on dropped back baits. Sizes ranged up to 130 pounds. The billfish were found spread out through the region, but not as numerous as they were on the grounds farther offshore. With the warmer water we are finally seeing some dorado appear. Still no significant numbers, but at least they are showing up on a daily basis; most of them weighing in the 5- to 15-pound category. There were a few reports of larger bulls hooked and lost. Wahoo were also in the mix. 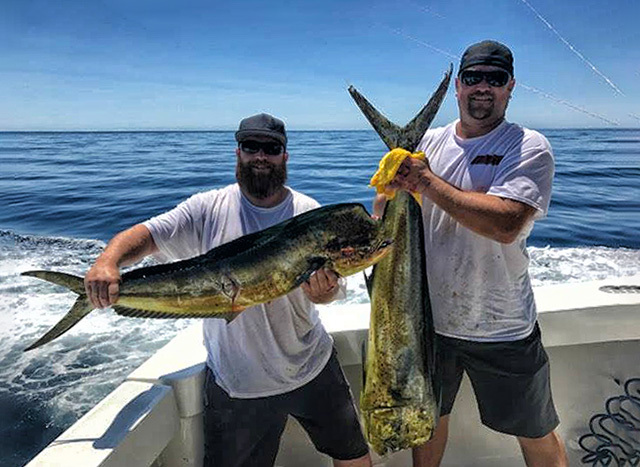 Anglers reported hooking into one while trolling various baits, as well as hooking some on Rapalas; again no numbers, but a chance at a couple of fish … weights ranged from 20 to 35-pounds. 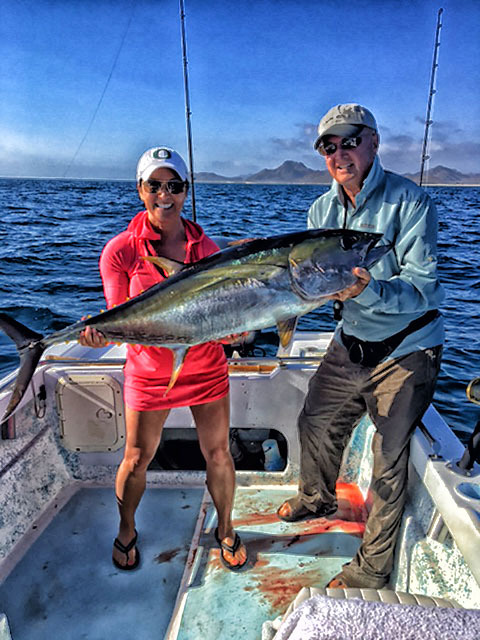 Yellowfin tuna often become more picky during the full moon period, but they are definitely in the area; most of these fish are now concentrated from the San Luis to Vinorama areas, ranging from smaller footballs to over 60 pounds. 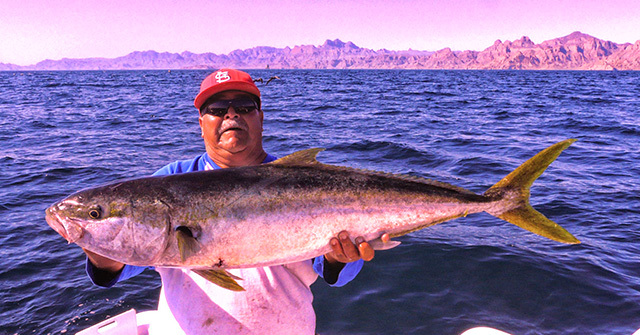 Best chance of hooking a nicer-sized yellowfin was while slow trolling with live caballito. 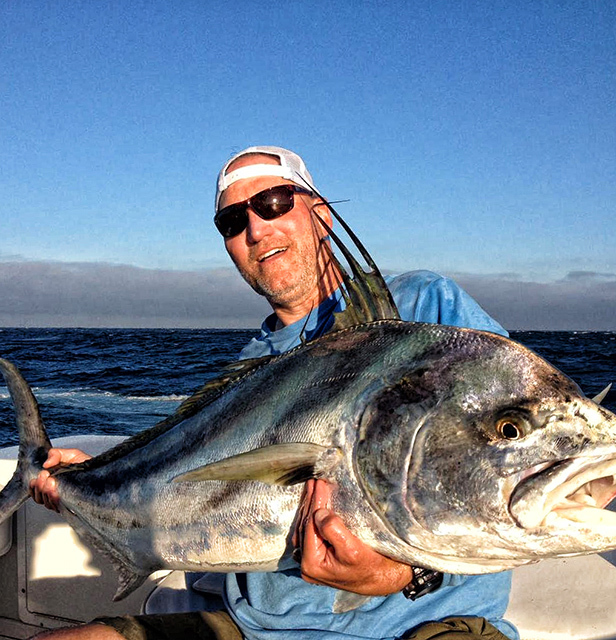 The tuna were shy though and anglers were fortunate to land one or two, striking more frequently on lighter leaders. 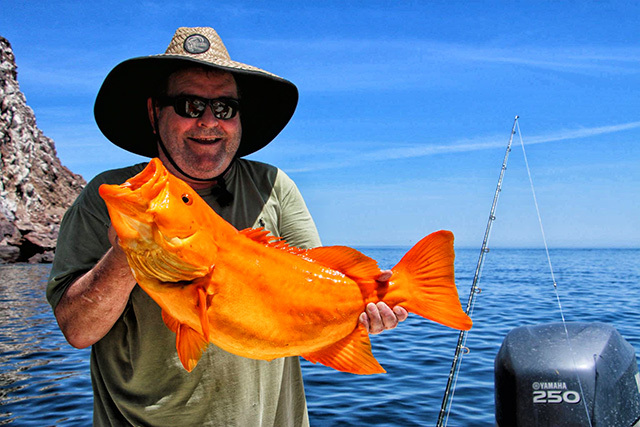 recently we have seen some much larger roosters, included an 80-pound class fish that was successfully landed and carefully released. 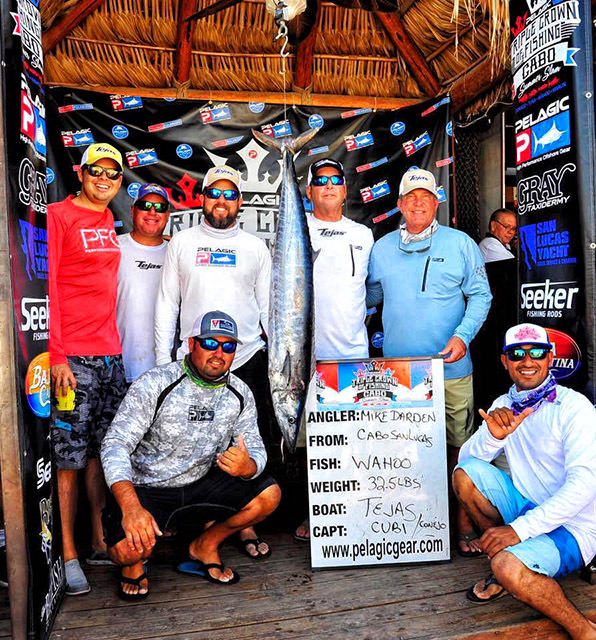 Also Conejo fishing on the 42 YLF TEJAS took home the Wahoo Division. Great Job Guys! 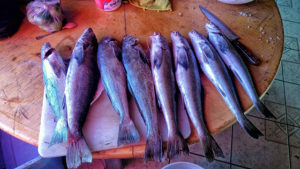 Bait supplies are mostly consisting now of caballito and mullet; only very limited amounts of sardina are being netted as they commonly migrate elsewhere this time of year when the warmer currents move in. always a very favorable sign as they are a preferred food source for many gamefish. Marlin Fishing Decent Two Miles Off Arch! 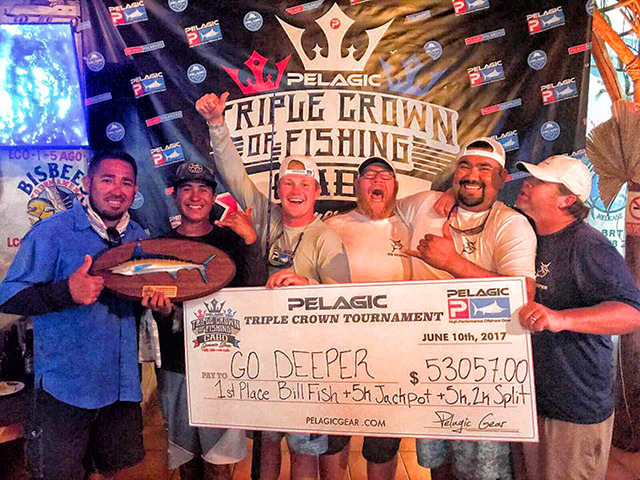 Overall, the billfish bite did pick up for a few of the boats that worked hard at the effort, but still, the fish were not overly willing to bite and shunned the baits presented. Cabo Climate: Daytime air temps averaged 80.8 and nights averaged 71 degrees. Humidity ration averaged 55.66% for the week. It was mostly a sunny and warm week with a couple of days that had passing clouds. Sea Conditions: On the Pacific side, from the Finger Bank and south to the Jaime Bank, temps varied from 64 to 66 degrees. 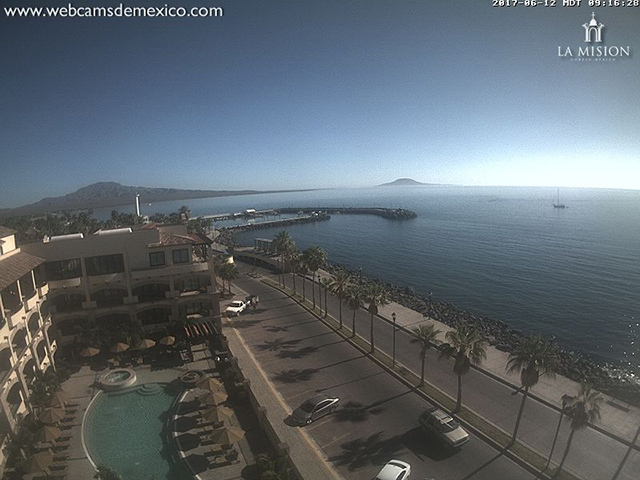 South of the Jaime Bank and across the 1000 Fathom Curve and then easterly to Cabo Falso, temps were at 70 to 71 degrees. Cabo Falso and around the corner to Los Frailes varied from 76 to 81 degrees, warming up the farther into the Sea of Cortez it went. Sea surface temps flowing from the westerly directions averaged about 15.6 mph daily. 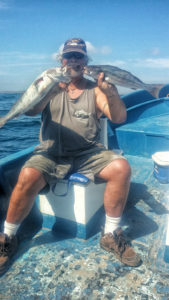 Best Fishing Area: Almost everything is being caught on the Sea of Cortez side of Cabo as the water temps on the Pacific side remain very cool all along the southern coast line from Magdalena Bay to Cabo Falso. The 1150 Fathom Spot was the best billfish bite area this past week. Best Bait-Lures: Live Bait continues to be best for the billfish and for the roosterfish. 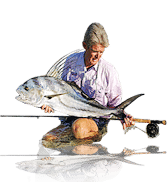 Live Bait Supply: The live bait supply remains good for the anglers and continues to be at the rate of $3.00 per bait rate paid direct to the bait vendor at time of receipt. …Larry Edwards, Cortez Charters.